At first, many were somewhat skeptical about the mashup between Angry Birds and Star Wars, but that turned out to be one of the better (if not the best) Angry Birds game yet. If nothing else, the mashup may have revived a somewhat stagnant property. And, it looks like that may have just been the start of a new trend. 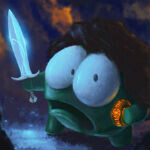 Now, it looks like popular physics puzzler Cut the Rope may be getting a mashup with The Hobbit. Cut the Rope developer ZeptoLab tweeted out a picture today of CtR's hero Om Nom looking like he's on a quest through Middle Earth. 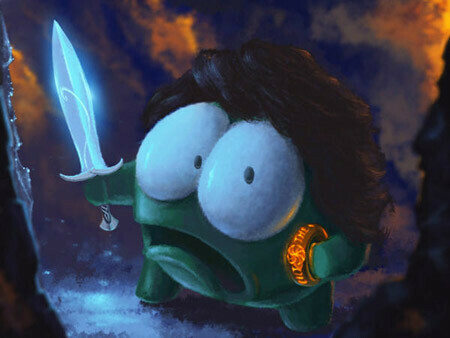 Om Nom is complete with the One Ring, and the glowing sword, Sting, which would seem to indicate he's about to be attacked by an orc. ZeptoLab will be unveiling what the image means tomorrow, but it would seem that there is going to be a Cut the Rope mashup with Middle Earth. The Hobbit seems more likely, given that is the movie in theaters now, but it is also possible that the game mashup will span through the Lord of the Rings trilogy as well. Whats next? Maybe Temple Run wipl join up with Halo 4 or something else! !! !